"I am so saddened to hear that Lori has passed away. It is so difficult to live "
"Dear Lori, Lori, With a heart of gold and the kindest soul I ever knew, you wi"
"Your smile and your positive outlook will be greatly missed. " 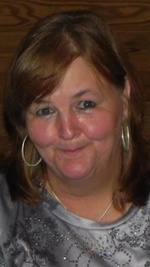 "Dear Roche brothers family and Friends I am crying about the Loss Of Lori Roche "
"So sorry to hear of Lori's passing She was always a positive happy person sharin"
Lorene (Lori) Ann Roche, 57, of Ayer, formerly of Acton, on September 3, 2018. Lori was the beloved daughter of Gail Roche of Las Vegas, NV and the late Norman Roche. She was a graduate of Minuteman Regional Vocational Technical High School in 1981. She was a longtime employee of Roche Bros. supermarket in Acton. She was an avid baker and her greatest joy was spending time with her family and many friends. Besides her mother, she is survived by four brothers and their wives, John and Robin Roche of Moultonborough, NH, James and Linda Roche of Francestown, NH, Lawrence Roche and Janine Klein-Roche of Boxboro, MA, and Norman Roche and Nicole Talbot of Groton, MA; a brother-in-law, John Schmider of Westford, MA: two step-sisters and their husbands, Deborah and Gary Montecalvo of Attleboro, MA, Cathy and Jerry Bolduc of Chelmsford, MA; and a grandniece, Rebecca Marchand of Townsend, MA. Beloved aunt to Brian, Curtis, Kyle and Hannah of Westford, MA and Evan Roche of Somerville, MA, Brady Roche and Inez Gonzalez, of Boston, MA and Trevor Roche of Baltimore, MD. She is predeceased by her sister Kathy Schmider.